Starting a business while making a business profitable in the early years can be at times both tough and frustrating without the proper knowledge or support. Slow revenues, or insufficient funds, and finding creative ways to cut the costs while working toward the profit. Many find the struggle to balance business and personal finances which are just a few of the many challenges facing self-employed people. 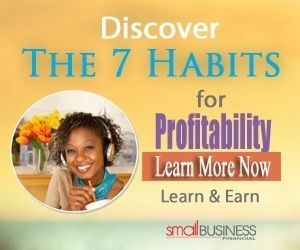 There are 7 highly effective habits needed to jump start your business on to a profitable footing, with the entrepreneurial instinct already set, anyone who wants to see themselves succeed will find what works for them until it clicks. Learning to make a business profitable is sticking to the habits, the habits that work in favor and are beneficial for you and your business. You have to believe in yourself and your business. Always think of everything three steps ahead. The hardest thing is usually the thing you should be going after. Go in the same direction with every decision you make. Creating connections, your own luck and further opportunities. Helping and sharing is content marketing. The growth mindset in believing you can and will get better. 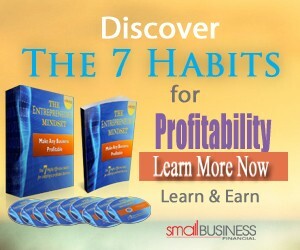 The 7 habits to make a business profitable as you build on the foundation and look on to branding and marketing. To be considered a serious entrepreneur you must have an understanding of business essentials and all avenues must be considered. Lenders and investors expect you to know before you approach them if you want their backing. Without an understanding of this information your business may suffer and you could possibly go out of work before you have a chance to start. As a small business owner some courses can help which outline key factors and the essential information to achieve higher profits. Marketing ideas that get results, with strategies to control costs and key parts of the 7 habits to make a business profitable.